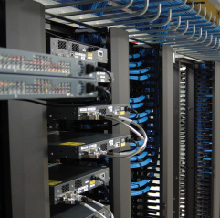 Network cabling services, when installed by Superior's installation personnel, offers business organizations a surplus of options depending on your business needs. Superior has certified BICSI installers and project managers who understand the requirements of delivering top notch network cabling solutions. Superior Information Systems offers free quotes and network evaluations for both new and existing cabling projects. We do this to provide our customers with up-front, fair and focused treatment. We certify all cable once we install it, ensuring that your cable will work as expected. We also follow all EIA/TIA codes and are available to work around your schedule for your convenience. SIS is committed to protecting your data center budget by offering fixed-bid pricing based on your budget when possible. However, for those projects where the design/build scope cannot be fully defined at proposal time, we also offer cost plus estimates.